Can Businesses Use Hyperlocal Marketing to Leverage Politics? There has been significant coverage about the differences in Democrats and Republicans, but to date there hasn’t been any analysis of real world activities associated with political affiliation. Voting Democratic or Republican plays a part in which establishments we step foot in and which ones we don’t, from grocery stores to restaurants and from retailers to gas stations, presenting brands and candidates with very powerful insights into their constituents. Whether you’re a political campaign strategist or a marketing manager for a brick-and-mortar retailer, understanding the offline behaviors of your audience provides rich insights to help you build a more complete profile of your audience, their preferences, and what this means to your organization. For instance, political digital ad spend is expected to increase sixfold from 2008 to 2012. In this most recent election cycle candidates started experimenting more with mobile to engage voters and potential converts. As the shift to smartphones continues, political dollars will move towards mobile and with that we will see the advancement in sophisticated mobile advertising campaigns that utilize mobile’s most unique and valuable trait — location. Utilizing this location and place insight, strategists can build location-based campaigns that target loyal party affiliates with “get out the vote” or “donate” messaging, or potential converts by targeting businesses that reach parity for Democrats and Republicans, and are likely to include a more moderate and potentially high-conversion visitor base. On the flip side, businesses that better understand the political composition of their visitor base could anticipate and react more quickly to potential issues that result from partnerships with personalities that have a strong political leaning. For instance, the backlash resulting from Donald Trump’s tweets surrounding President Obama’s reelection resulted in more than 670k signatures on a petition to remove Trump’s product line from Macy’s. Utilizing this place data, Macy’s could quickly quantify that Democrats were 31% more likely to visit a Macy’s and that Trump’s comments against a Democratic President could potentially impact Macy’s brand perception across its most loyal customers. In an effort to build an accurate “places profile” of today’s electorate, we analyzed the activities of opted-in panelists via their mobile device to determine the businesses whose customers lean left and those that lean right. This data is an aggregation of pilot participants of Placed Panels. Democratic and Republican affiliation was determined at the county level where Obama or Romney won by greater than a five percent margin. Grocery Stores – Trader Joe’s: Democrats were nearly twice as likely to visit Trader Joe’s compared to the average U.S. citizen (index of 174). They were also more likely to visit Whole Foods (index of 139) and Safeway grocery stores (index of 134). Restaurants – Dunkin’ Donuts: Democrats were 60 percent more likely to frequent Dunkin’ Donuts than the national average. They also displayed a higher tendency to visit Starbucks, White Castle, Popeye’s Chicken & Biscuits, Chipotle and Jamba Juice. Retail — Macy’s: Democrats had the strongest skew towards shopping at Macy’s, with the Apple Store and CVS also skewing toward the left. Gas Stations — Love’s Travel Stops: Republicans had a high tendency to visit travel centers and gas stations overall compared to the national average. People in Republican counties were 2X more likely to visit Love’s travel stops, Pilot Flying J travel centers and Sheetz. 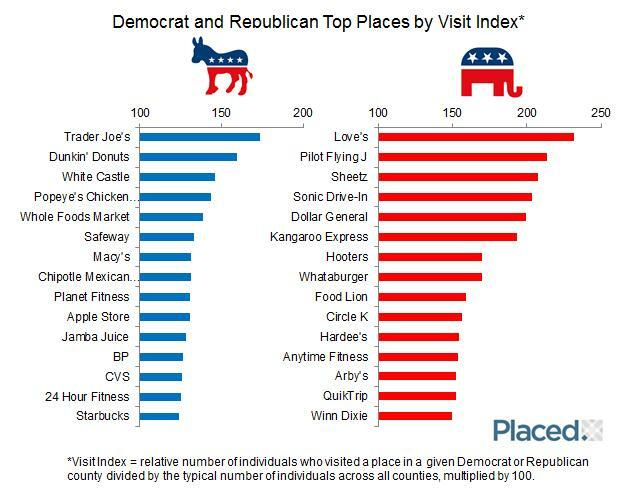 Restaurants — Sonic Drive-In: Republicans were more than twice as likely to visit Sonic. Hooters, Whataburger, Hardee’s and Arby’s also skewed to the right. Retail — Dollar General: Republicans were 2X more likely to visit Dollar General compared to the national average. The impact of quantifying the physical world goes beyond politics. For example, Placed quantified the effects of Hurricane Sandy on real-world behaviors taking assumptions and converted them into action able insights that could help governments, businesses, and organizations plan and react more efficiently to specific events like Hurricane Sandy. Looking at location data helps turn what was once vague anecdotal assumptions into factual conclusions that have the potential to powerfully impact how we understand, predict, react, and change human behavior. This article originally appeared on Street Fight. This entry was posted in Data Insights, Placed Panels by David. Bookmark the permalink.